Late fall and winter actually become easier to bear when it’s finally snowing, and just beautiful to be outside! What eases the early darkness of this season even more for me is, coming back indoors, watching a fire in the fireplace, and – let’s face it – the amazing foods of the season! Freshly pulled leeks are one of these treasures. If you’ve ever done it – you know– they just don’t want to let go! A kind of garden tug o’ war, leaving me jounced back on my rump in the dirt when they finally gave up! You just can’t beat freshly pulled leeks – if you’ve ever done it, you know! They do not give up their place in the ground easily! We couldn’t believe how long their leaves – shall I say tresses – were! These are also sooo tasty – not ever to be thrown away in my kitchen! 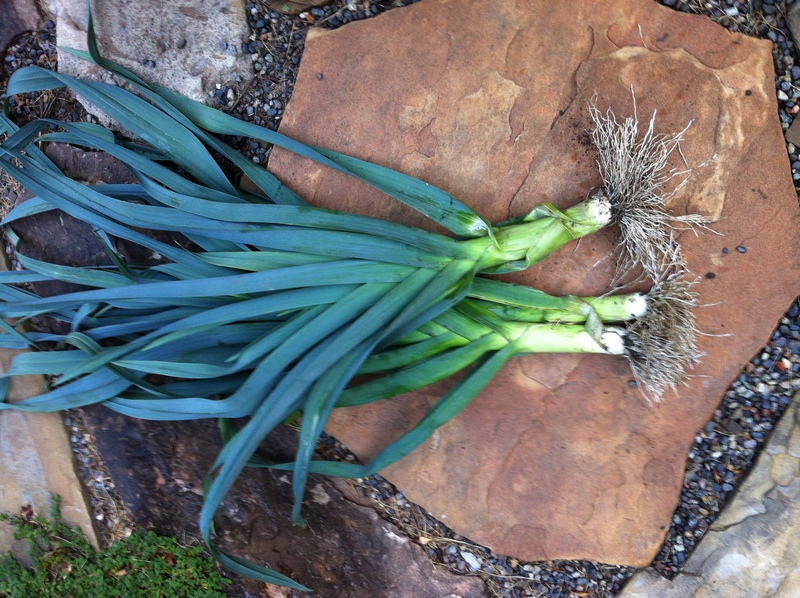 I actually went into a kind of rapture, marveling at my very first homegrown leeks last year. My mind takes me back in time, and I’m standing in whites, making huge pans of this perfect holiday side dish. Baked leeks in two cheese sauce with crunchy torn bread atop. Highly recommended by all who partake. Rich. 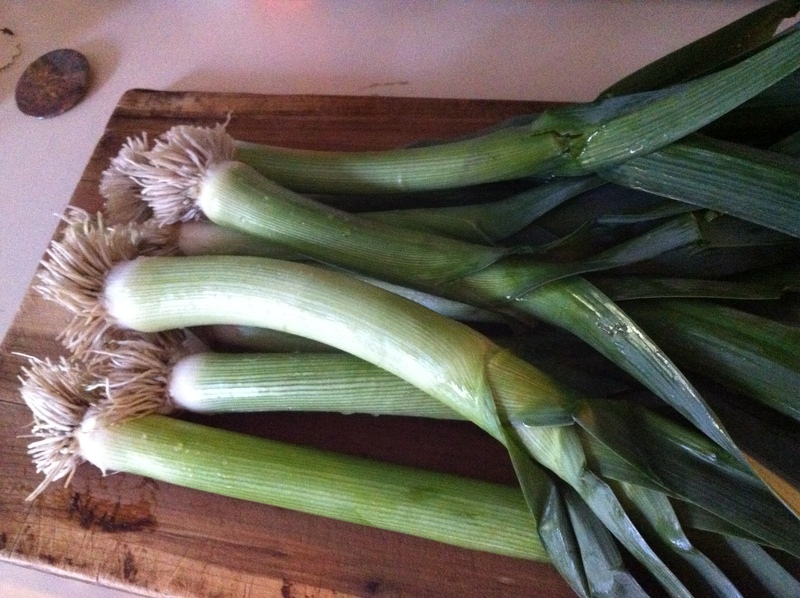 Wonderful country French recipe using the entire length of leek, green and white. From my French Continental restaurant apprenticeship-to-chef days at L’Auberge … This recipe was made when the soup du jour was vichyssoise (that classic potato leek puree), which uses just the white portion of the leeks, taught to me by Brigitte herself. We actually JUST used the green ends for the gratin, but since that time I’ve used both and of course it is lovely! White pepper has a distinct, amazing flavor and I nearly swoon with it’s pairing here – freshly grated nutmeg, thyme, and cheese. Just like any proper gratin, the leeks are baked in the mornay sauce – topped with freshly torn bread and a sprinkling of more cheese. minutes. Slowly pour in milk, whisking to thoroughly blend and thicken. Stir in cheeses and seasonings. Pour over leeks in casserole dish, and evenly mix. Top with torn bread and the scattering of remaining cheese. 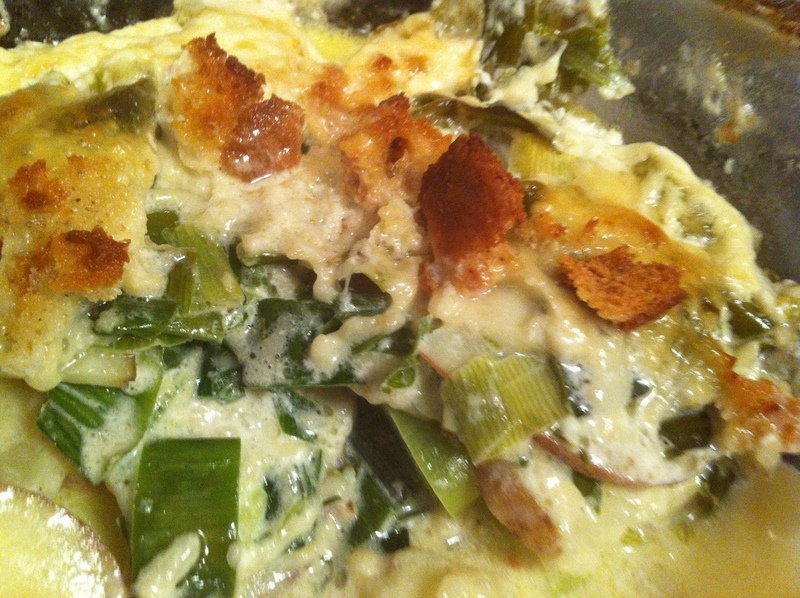 Bake uncovered on the center shelf 35 to 40 minutes, until leeks are tender, sauce bubbly and gratin is lightly browned. The French have a way with that, don’t they?! Thanks for stopping by! Oh it is. L’Auberge, and the Fawn Valley Inn, Estes Park, Colorado….long, long ago, but not so far away!